Great Home, Great Location and Close to UA! 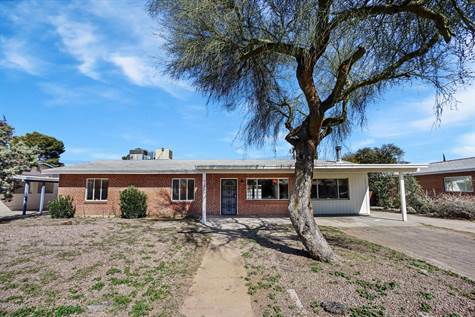 Spacious, Open Floor plan, 3 Bedroom, 2 Bath with Saltillo tile through out. Living room with Fireplace and Entertainment Center. All Appliances stay, beautifully remodeled Kitchen with sky light, Dining area with French doors to backyard, Mid century style bathroom. Ceiling fans, Laundry room w/Wash/Dryer, Screened Patio, Large, blocked wall backyard, TUSD School District.